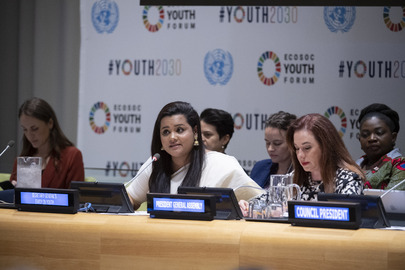 Jayathma Wickramanayake (centre), United Nations Secretary-General's Envoy on Youth, delivers a statement during the opening session of the 2019 Economic and Social Council (ECOSOC) Youth Forum. The theme of this year's Forum is “Youth: Empowered, included and equal”. María Fernanda Espinosa Garcés, President of the General Assembly, is at right.